Hey there, and thanks for coming along with me as we look at Vanguard’s lineup of spotting scopes. This company has a small, but still robust, catalog of sporting optics. I’ve examined quite a few of its products, and can help you identify which spotting scopes are the best for the nature enthusiast and backyard astronomer. Let’s see what Vanguard has to offer, and what you can expect from the glass. If you find yourself on a somewhat tight budget, you’ll definitely be interested in this optic. The Vanguard Endeavor XF 60A offers a fair deal of quality at a price that won’t burn up your pocketbook. The XF 60A has impressive zoom capabilites of 15X to 45X with a twilight factor of 30 to 51.9, making it good for backyard astronomy. Unfortunately, the scope suffers from chromatic aberration at high magnification, lending a purplish tint to the image that might not be ideal if you want true color reproduction. 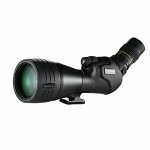 If you want the best of the best, check out Vanguard’s Endeavor HD 82A, a 20X to 60X spotting scope with an 82mm objective lens for amazing light transmission. This model provides you excellent color reproduction, thanks to high quality optics and the use of extra low dispersion (ED) glass, and a twilight factor of 40.4 to 70.1. The primary drawback of this optic is its weight, a bull 63.8 ounces, almost four pounds. Since you’ll likely be using this spotting scope on a tripod, that shouldn’t deter you from enjoying it. What Do Spotting Scopes By Vanguard Have In Common? This company’s spotting scopes are all constructed with a magnesium alloy housing coated in rubber armor. They all utilize BaK–4 prism glass, with phase correction coating applied to improve the optical quality of the scope. Vanguard uses a center focus mechanism on all of its spotting scopes, and engineers the glass to offer good fields of view. While this wasn’t always the case, Vanguard’s spotting scopes all utilize angled eyepieces. Do I Get Important Accessories With My Purchase? When you purchase a Vanguard spotting scope, you get some terrific accessories to make the most of your investment. Each model comes with objective and eyepiece covers, a deluxe carrying bag, and a lens cleaning cloth. You won’t find a tripod in the box, however. In my view, this isn’t necessarily a bad thing – most bundled tripods are poor in quality anyways, and aren’t worth the extra weight in the box. Just buy your own tripod, and you’ll be perfectly happy. How Much Magnification Can I Get? Depending on the model you choose, you’ll either have 15X to 45X magnification, or 20X to 60X. With Vanguard’s HD models, the use of ED glass minimizes color fringing and ensures accurate color rendition throughout the entire range of magnification. The XF series, on the other hand, lends a purplish tint to the sight picture that gets rather annoying at high levels of magnification. 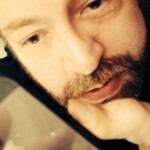 Other than that, every model provides excellent crispness and clarity. Are Vanguard’s Spotting Scopes Easy To Use? These scopes all have large focus wheels for easy use, even when wearing gloves. There’s nothing tricky about operating the glass; you simply twist the eyepiece to get the magnificaiton level you want, then use the center focus wheel to get your subject clear and sharp. The focus and magnification controls move smoothly, but with enough friction to prevent accidental adjustments, and several models offer dual focus controls for fine and coarse adjustment. How Good Is The Focus On The Glass? As previously noted, the focus controls on these optics are very easy to use, even if you’re wearing gloves. No matter what magnification level you choose, the image sharpness is truly outstanding, but this is even more noticeably so with the HD series of spotting scopes, which utilizes ED glass. Does Vanguard Use High Quality Optics? Yes, Vanguard uses premium materials in its spotting scopes. The products feature BaK–4 prisms in a porro prism configuration, with phase correction coatings to prevent phase shift. To maximize light transmission, the variants all have fully multicoated optics. Will I Find Good Materials In The Scope’s Housing? These spotting scopes all sport magnesium alloy housings, to minimize weight, coated with rubber armor. The products are as lightweight as possible, but still offer plenty of shock resistance. I’m A Backyard Astronomer – Will Vanguard’s Spotting Scopes Help Me? Large objective lenses and excellent application of fully multicoated optics provides for great transmittance. I’ve used my Vanguard spotting scopes in the backyard on many a night to view the rings of Saturn, the surface of the moon, and even constellations. While you’ll get much more astronomical value out of a telescope, these spotting scopes are definitely great for getting started in backyard astronomy. We’ve already talked about the housing of the spotting scopes, constructed from rubber-coated magnesium alloy, but let’s talk real turkey. These products are extremely durable and long-lasting. The lenses are sealed with O-rings and the optics chambers are nitrogen-purged, so you get a spotting scope that is shockproof, waterproof, and fogproof. The lifetime warranty will get you back on your feet quickly if something does go wrong, but it seems like it might take being run over by an Abrams tank to do any damage to these scopes. Thanks for checking out my writeup on Vanguard’s spotting scopes. These products aren’t absolutely perfect, but the HD series of spotting scopes is, I think, about as close to it as you’ll find. 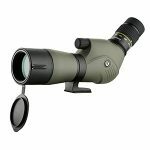 The Vanguard spotting scopes come very close to rivaling the more expensive Swarovski, so I can highly recommend them.